The Digital Arts Experience invites you to attend Open House for its Summer Programs on Saturday, June 29th from between 12PM-3PM. 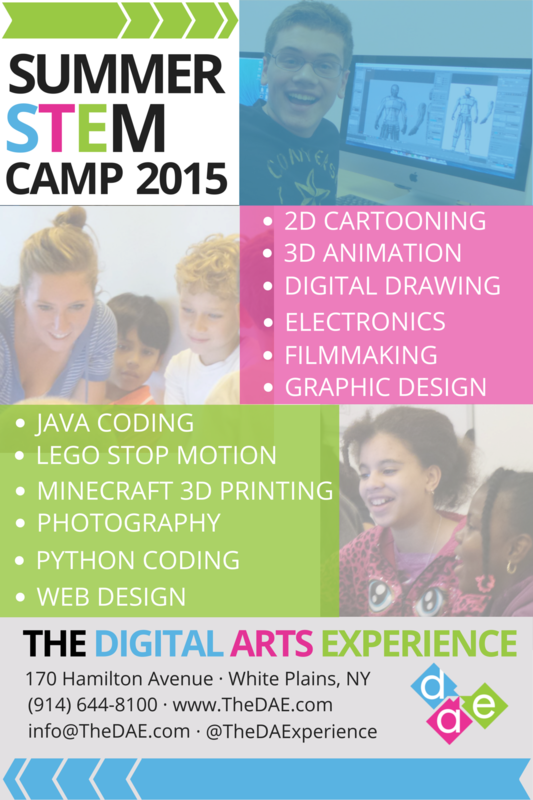 Located in the heart of downtown White Plains, The DAE’s summer programs give kids and teens ages 10+ to choose their area of interest in either: 2D/3D Animation, Graphic Design, Moviemaking, Photography, or Web Design. Each class is hands-on, and contains a maximum of 6 kids so that everyone gets the personal, individualized attention that they deserve. Students will leave with a final project completed, as well as a plethora of new knowledge in their chosen area of interest! Sign up before June 20th and receive a 10% early enrollment discount on the camps! Feel free to call 914-644-8100 for more information, or e-mail info@thedae.com. We look forward to seeing you here!